Town Hall presents Broadway Rising Stars, a national showcase that introduces New York audiences to the next generation of up-and-coming talent as chosen by a panel of discerning judges from among the most outstanding new graduates from performing arts schools and departments throughout the country. The 2017 Rising Stars is spearheaded by Scott Siegel, creator/writer/host of Town Hall's beloved Broadway by the Year series. 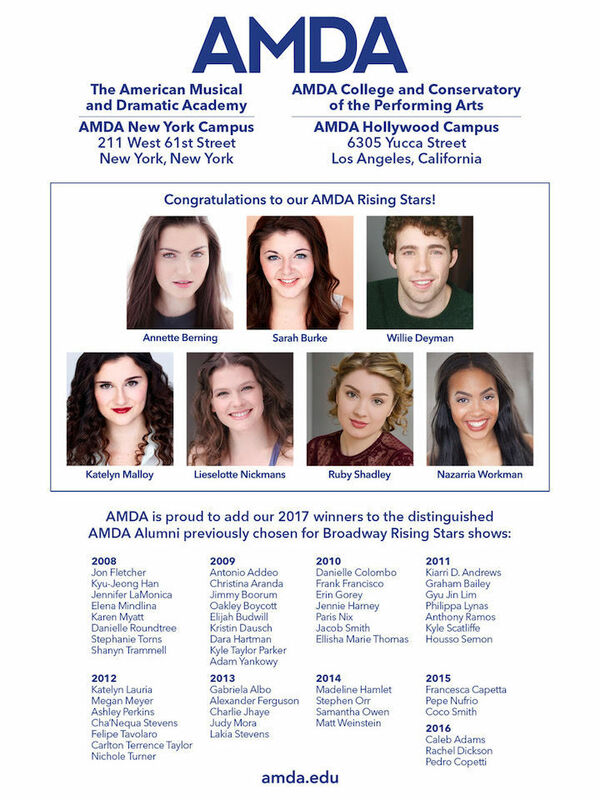 In the ten years since Broadway Rising Stars first began, participants have scored top billing casting in Broadway shows as diverse as Wicked, Beautiful, Jekyll & Hyde, Hair, Les Miserables and Hamilton. Past Rising Stars have appeared on television in The Glee Project, Glee, and A Christmas Carol. They have starred on the West End, been nominated for the prestigious Olivier award and played in countless national tours both in the U.S. and abroad.